David Buttifant delivered an entertaining and informative presentation on “How to deal with stress”. He demonstrated that by changing simple behaviours, we can influence how we achieve our goals. Everyone in attendance enjoyed a delicious breakfast while listening to David’s presentation. It was great to welcome new guests to our Business Network as well as welcome back familiar faces. Our Inaugural industry Expo, “Return of the Alumni” proved to be a huge success for our presenters, students and parents alike. Eleven Old Collegians ran sessions on various industries, giving participants insight and valuable information into their respective fields. Our 2019 year 7 parents were blessed with a perfect autumn evening to enjoy the annual Year 7 Parents Social Night. This evening is a great opportunity for year 7 parents to get together,in a very relaxed environment, to meet and catch up with other parents. We were delighted to welcome back eminent Old Collegian, Richard Olive to our first in a series of Alumni Masters Presentations. Richard provided and entertaining and informative presentation on his journey from Marcellin College through to his esteemed career in Civil Engineering. The feedback from the evening was very extremely positive and we look forward to our next presentation on May 14 with Old Collegian, Darren Mort. The Class of 1998 caught up for their 20th reunion on Friday 23 November at the Glenferrie Hotel. The room was abuzz with chatter and laughter as the group reminisced their school days and life beyond. Thanks to Pete Curry, Carmine Ciavarella, Adrian Bonacci, and Steve Dinneen for all of their hard work in the lead up to make the night a great success. The Year 7.2 Core Group had a perfect day for their end of year lunch at Stix and Stones in Lower Plenty on Sunday 18 November. Some of the group took the bike path from Heidelberg and rode their bikes to the restaurant, taking in the scenery while they enjoyed the beautiful weather. Everyone had a lovely time catching up for the last formal gathering of the year. Thanks to Louise Muller, Megan Gravell, Rachel Cleary and Maureen Hegarty for organising the event. The Class of 1978 were blessed with a warm and balmy night on Friday 16th November for their 40th reunion. The group met at Marcellin College for a school tour led by Old Collegian (1981) and Marcellin Foundation Manager Chris Mirabella. Many had not been back to Marcellin since they left 40 years ago, so were duly impressed by the new buildings and improvements that have taken place over the years, but especially of the new Hermitage Building. After the tour, the group headed over to the Manningham Hotel (aka The Sentimental Bloke) for canapes and drinks accompanied by lots of reminiscing, story telling and laughter which continued well into the night. Steve McCarthy did the formal welcome, Adrian Collins (1978 School Captain) prepared a speech the ever entertaining John Canavan provided a comedy routine. 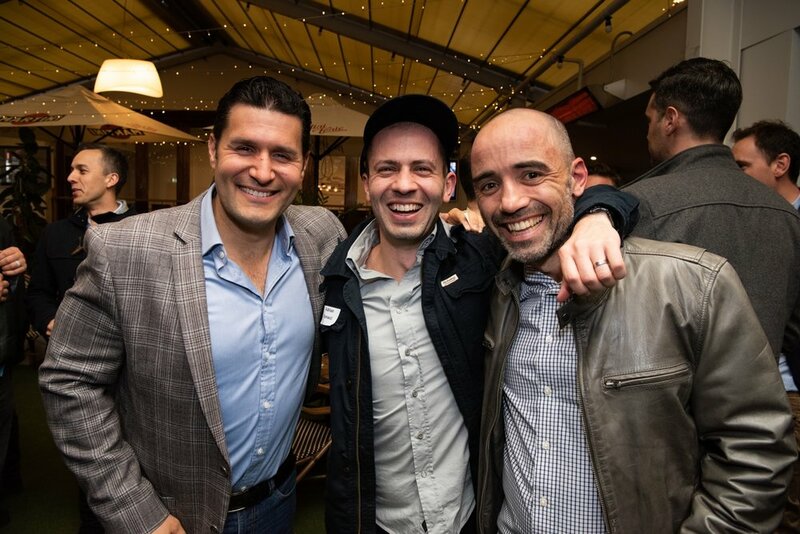 A big thank you to our organising committee who worked so hard to find and connect with people and encourage them to come along; Andrew Cullinan, Rob Tankey and Steve McCarthy. The Marcellin Class of 1988 celebrated their 30th Reunion on Friday 9 November. The evening began with a College tour led by Principal, Mark Murphy where the group marvelled how much the College has changed in the last thirty years. Following the tour they moved on The Manningham to spend the rest of the evening catching up and reminiscing their school days. A great night was had by all in attendance. We thank the key organisers of this event, Class of 1988 Old Collegians, Antony Giacomin, David McIntosh, Glenn Bartlett, Tony Wright, Dino Pase and Michael Simmonds. On Friday 9 November 86 men from the 2008 cohort met and celebrated their 10th Reunion. The event was held at Welcome To Thornbury, Melbourne's first permanent Food Truck park. The premises provided a separate area for the Marcellin boys and it was easy for them all to circulate and catch up with old mates. Overheard were lots of statements stating they couldn't believe it was 10 years since they left school. A huge thank you to Jono Kardamani who was instrumental in organising and contacting everyone. Old Collegians, Fr Steven Rigo and Fr Peter Ferwerda celebrated the Memorial Mass for Deceased Old Collegians on 1 November in the Marcellin Chapel. Supper was served afterwards, where our community members had the opportunity to connect and share their stories. We thank Mary Norden and Doreen Theisz for their continued support for this important annual event on the Marcellin community calendar. We also thank Fr Steven and Fr Peter for coming along to celebrate a very moving Mass. 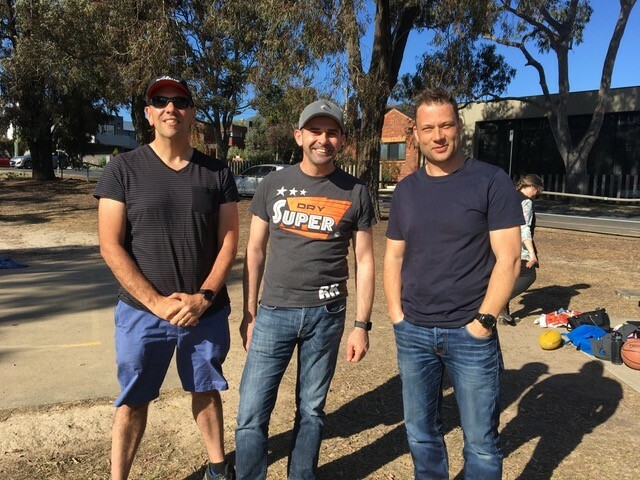 Thank you to Heidi Michailidis who organised a great catch up for the Year 7.4 boys and their families at Ivanhoe Park last week. 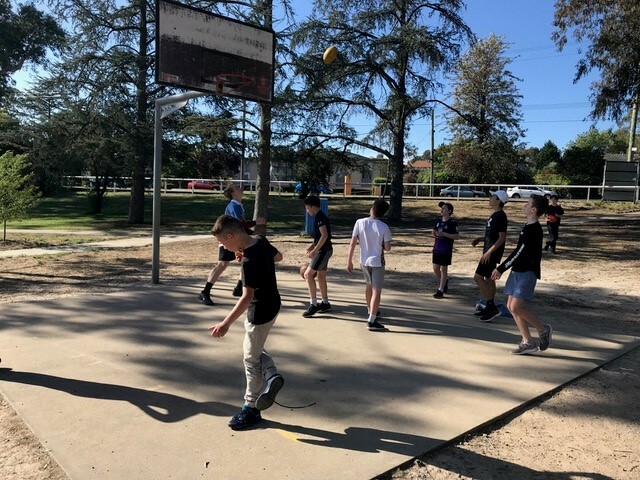 The boys enjoyed their time playing football and basketball while the parents were able to get to know each other a bit better. 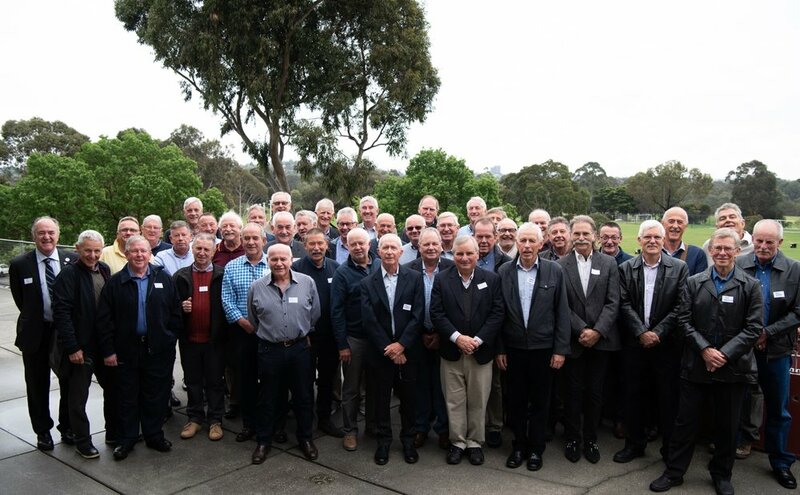 Marcellin's Class of 1968 had a wonderful time catching up for their 50th Reunion on Saturday 20 October. The group enjoyed a College tour led by Principal, Mark Murphy before moving on to lunch in the Functions Room where there was lots of reminiscing. Some had not been back since they left 50 years ago! On Thursday 6 September, the Mums from 7.4 had a casual get together which all enjoyed. Thanks to Heidi for organising. The Marcellin Business Network ventured to Kooyong Lawn Tennis Courts for our latest event. The venue proved to be a popular choice and as the sun came up it was great to view the expanse of beautiful courts in front of us. Kylie Bell from Wren Learning was our presenter for the day. The topic on Self Determination Theory was most interesting and inspiring to all participants. Kylie focussed on Intrinsic as opposed to Extrinsic motivational factors and how these can affect how we perform. We were provided with concrete examples of how the Motivation Continuum can influence our behaviours and were able to see how different types of employer can have a direct influence on employee outcomes. The themes of Relatedness, Competency and Autonomy were covered and again Kylie engaged the group in interactive learning to reinforce her teachings. If anyone would like to speak to Kylie about her running a session at your places of business please contact her on: kylie@wrenlearning.com.au or 0417 445 432. It was a double whammy for Marcellin and Trinity Grammar this year as they went head to head in the AGSV Football (it was Marcellin V Trinity for the Soccer as well) on Friday 15 June. Our panelists, Sam Power, Leigh Montagna and Graham Arthur hosted by former Marcellin parent and Channel Nine's Tony Jones, provided lots of laughs for our guests before they headed down to the Bray for the game. Everyone enjoyed afternoon tea back (and a break from the cold and wet) in the Functions Room at half time. There was great attendance from the families of year 7.4 Core Group at their social catch-up at The Manningham on Sunday 27 May. These low-key social gatherings are an excellent way for parents and families to connect and get to know one another. If you would like help organise an event for your son's Core Group, Please contact Prue (mailto:foundation@marcellin.vic.edu.au) or phone 9851 1464. 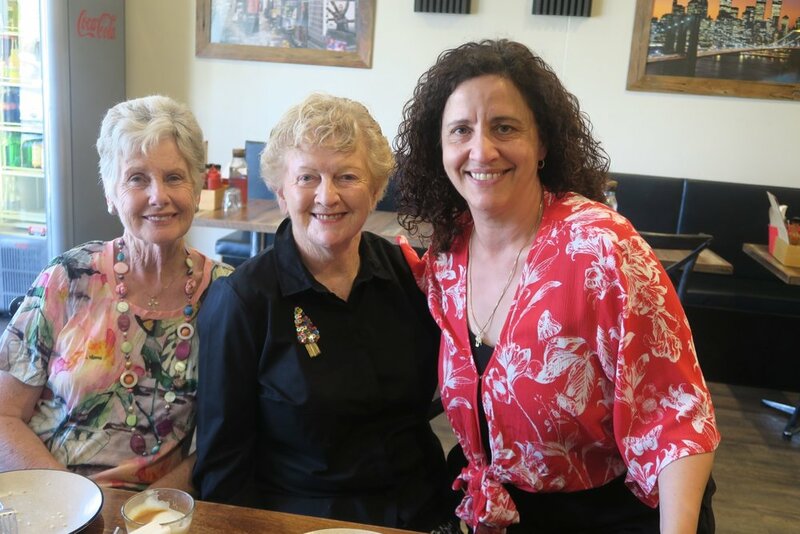 This year, due to ever-increasing demand (and the sellout of the first breakfast in less than a minute), the MCCA are very proud to have hosted two Mothers Day Breakfasts over 8 and 9 May. Both events were a sellout, and a huge success. The highlight was a special video presentation of some of the boys, who sent their very honest and heartfelt Mothers Day messages to their Mums. Over $2,000 was raised in the raffle that run over the two days. This money will go toward families who are experiencing illness and need a bit of extra support. There was a great attendance of families from Core Group 7.2 on Sunday 29 April at their Barefoot Bowls Day at Rosanna Bowling club. The group were blessed with a perfect autumn day and the venue was excellent for a family catch up - the boys had lots of fun as they tried their hand at lawn bowls while the parents were able to relax and chat over a drink. Congratulations to the Parent Reps on a very successful event. 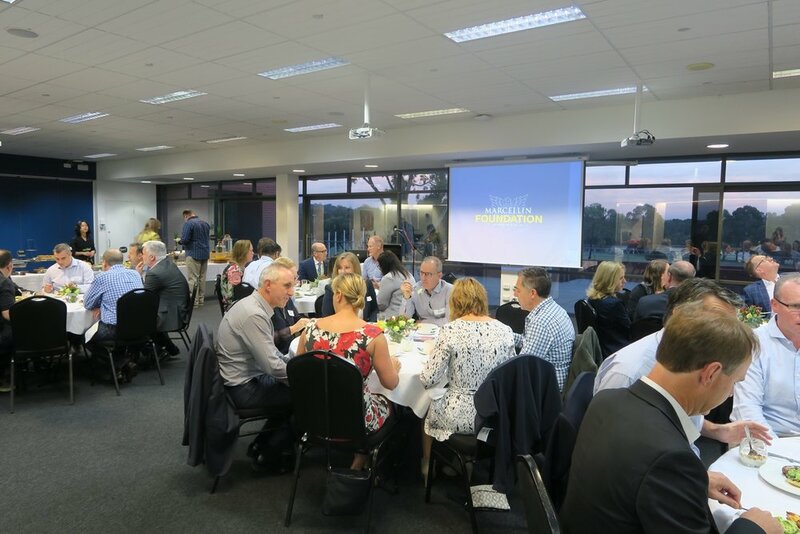 This year, we hosted an dinner event prior to an historic AGSV match between Marcellin and Trinity Grammar on The Bray. This was the first time an AGSV soccer game was played on the Bray under lights. Our guests enjoyed a relaxed dinner while they listened to our guest panelists - Mark Bresciano and Yanni Barberoglou hosted by current parent, Jason Carter. The Marcellin Business Network were back at the LinkedIn offices thanks to Old Collegian James Delahunty. Vanessa was able to demonstrate how using Sales Navigator could target more quickly potential clients and how one would go about doing that with hands on examples. Our audience found the session very engaging (with a few sales leads and follow ups for Vanessa) and we thank Vanessa for her input and time. On 23 March 2018 we had our Annual Business Network launch for the year. It was wonderful greeting many of our regulars and we were very pleased to welcome quite a few new faces, especially some families from our Year 7 cohort. Our guest speaker was Nathan Burke (past St Kilda player) who now runs Nathan Burke Consulting. He spoke to the group about High Performance and Reaching Potential in the workforce. It was inspiring to hear about some new ideas and suggestions as to how we could best reinvigorate our work places. Nathan’s wealth of knowledge and experience in creating rituals and developing personal routines to enable us to seize opportunities, was valuable. Breakfast was served by Green Leaf Catering who presented us with some delicious options. 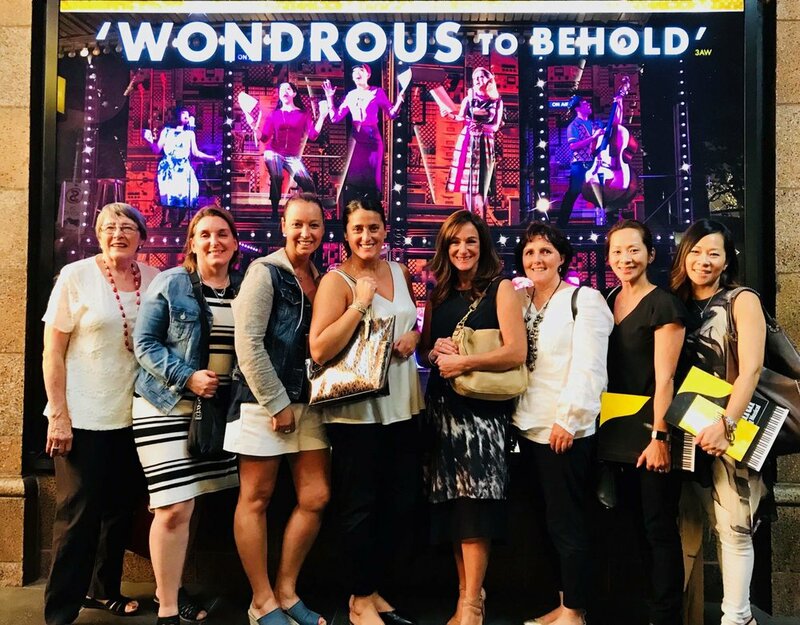 Last Thursday, a group of parents from our Friends of Marcellin Performing Arts (FOMPA) community attended Carole King - The Musical performance at Her Majesty’s. They gave it rave reviews and enjoyed every moment. Our Movie Nights are always very popular and our March 6 event was a sellout. The ladies enjoyed a glass of champagne and some delicious nibbles before they headed in to watch "Finding Your Feet" at Palace Cinemas in Balwyn. Thank you to everyone that supports these great community events. A big thank you to Ourania Rossi who again organised a night out at the Manningham Hotel for the Class of 7.1 and their families. They had 30 people attending and by all accounts it was a great night with the boys, their parents and siblings all enjoying some time to relax and catch up. 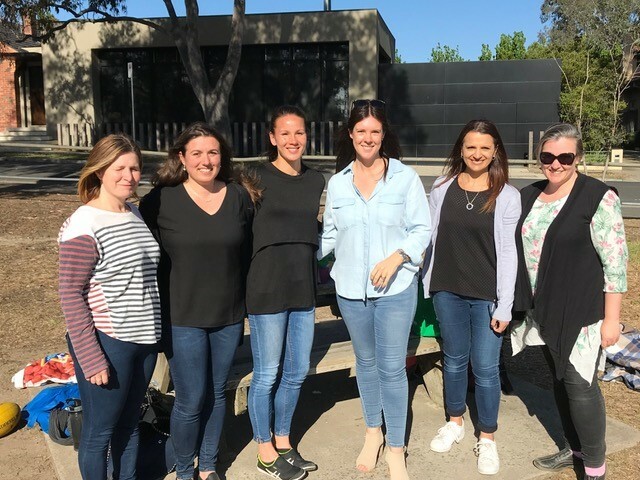 On a beautiful sunny Melbourne Spring day, 28 Marcellin Past & Present Mums, their friends and relatives gathered at the National Gallery of Victoria. We were met by an NGV guide who presented an interesting and informative talk on Dior, the House of Dior, the actual exhibition and the many designers who have been involved. We learnt of the history of Dior and how his role was influential in those times. We then visited the actual exhibition which showcases hundreds of outfits, shoes, hats, perfume bottles and many videos of catwalk shows over the years. It was fascinating to see the actual clothes in situ and then to see them being modelled. The NGV has done a wonderful job of presenting the clothes in a suitable setting with a two storey section and sweeping staircase as well as showing areas where the patrons could see how the clothes were put together. There is a huge array of items and our guests were fascinated by the beautiful lines of the clothes and we all wish we could dress like that now! Thank you to all of those who came along on the day. It was a wonderful opportunity for Mums from all eras to meet others, catch up with old friends and to be able to share such a great exhibition.